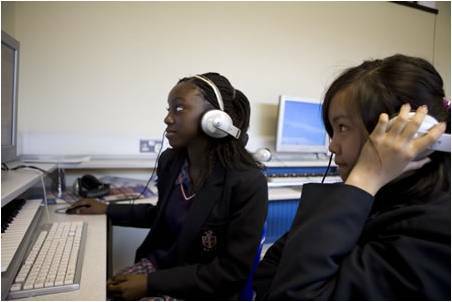 Students opt to study music from year 10 onwards. The department follows the Edexcel GCSE specification. Students receive three 50 minute lessons of music every week (1 single and 1 double), as well as a 25 minute singing/instrumental lesson. Students are also expected to complete their ABRSM theory studies up to and including Grade 5 level. Students must complete 2 recorded performances (one solo and one ensemble) and 2 compositions in contrasting styles. At the end of May in Year 11, students sit a listening examination that tests their knowledge and understanding of 12 set works from a variety of musical styles and traditions. The department has high standards and is passionate about maintaining these. Students are therefore expected to attend a number of lunch time tutorials and controlled sessions above and beyond the standard curriculum lesson time to ensure that their coursework is of the high level necessary.